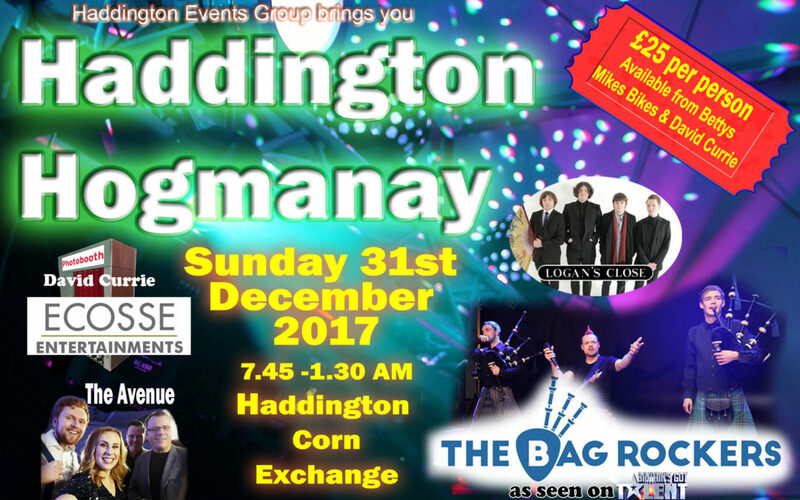 Come join us to celebrate the coming of the New year at the Haddington Corn Exchange. Acts include David Currie, The Avenue, Logans Close and headline act the Bag Rockers. Full Bar service, Photo booth and dancing through the bells. £25 per ticket…limited number of tables for up to 10 available (pre-booked tables must be seated by 8.30pm or tables will be given away). Doors open 7.45pm, bags and Id’s will be checked. If tickets are being bought for anyone under 18 (16-18 years of age) they must be purchased by adult (over 18) who is accompanying them.